Level hardstanding pitches available for Caravans and Motorhomes. Loose gravel so that awning pegs can still be used through it but hard enough for large caravans/motorhomes to use especially when the ground is soft or wet. 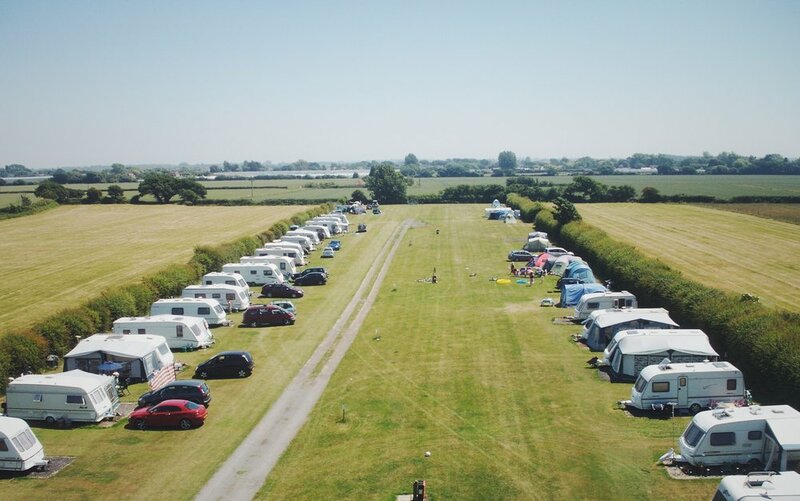 We also have grass electric pitches for caravans, motorhomes and tents. The site is sheltered from prevailing winds but still get lots of sunshine during the day and stunning starry skys at night. Each pitch can take up to 25ft long caravans/motorhomes. Men’s Facilities – 4 toilets, Urinals, wash basins with hot and cold water, shaver points, mirrors and two hot showers. Women’s Facilities – 7 toilets, wash basins with hot and cold water, full length and make up mirrors, hairdryer (20p charge), and two hot showers. Disabled facility – Wheelchair access, Raised disabled toilet, wash basin with hot and cold water and walk in hot shower with fold down seat and grab rails. Fold down Baby Change Unit. Washing Up area – 2 stainless steel sinks and drainers. There is also a microwave available for use if needed. — Suze and Phil Meredith.